Elon Musk knew from day one that his batteries were deadly. He knew this, as fact before he took over Tesla in a hostile take-over. Elon Musk, Tim Draper and Steve Jurvetson knew this before they invested in Tesla. They knew that the deal-with-the-devil that they made with Panasonic was a scam to dump the dangerous batteries in the market. Musk has known that his battery system was a scam but he went ahead and scammed the world any way. Third, when a lithium-metal battery discharges, lithium ions separate from the surface of the anode and travel to the cathode. When the battery is charged the same ions travel back and deposit onto the anode as lithium metal. But instead of forming a nice smooth coating on the anode, lithium metal has the tendency to generate “dendrites,” chains of lithium atoms growing from the surface of the anode, which look like the roots of a tree. The dendrites grow bigger with each charge-discharge cycle, eventually reaching the cathode and causing the battery to short, leading to fires. Musk chose batteries whose dendrites grow the fastest, furthest and are the oldest architecture. IN OTHER WORDS: TESLA'S ARE GOING TO INCREASE THE AMOUNT THAT THEY BLOW UP! Nearly 30 years later, however, we are brushing up against the limitations of the graphite anode and Elon Musk still won't use one of over 300 different energy energy storage systems because of the kickbacks he gets from his deadly batteries. You may have heard that Elon Musk intends to take Tesla Inc. private. Tesla sold 103,000 cars last year, which makes it the fourth-smallest listed carmaker by sales volume, according to Bloomberg Intelligence. 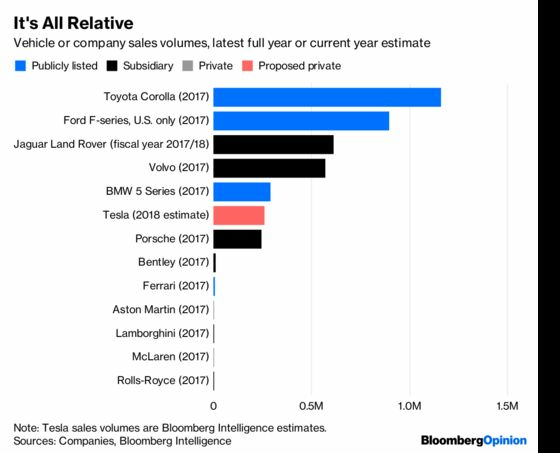 If Tesla becomes a private company, its projected sales volumes would make it an outlier in the auto sector. 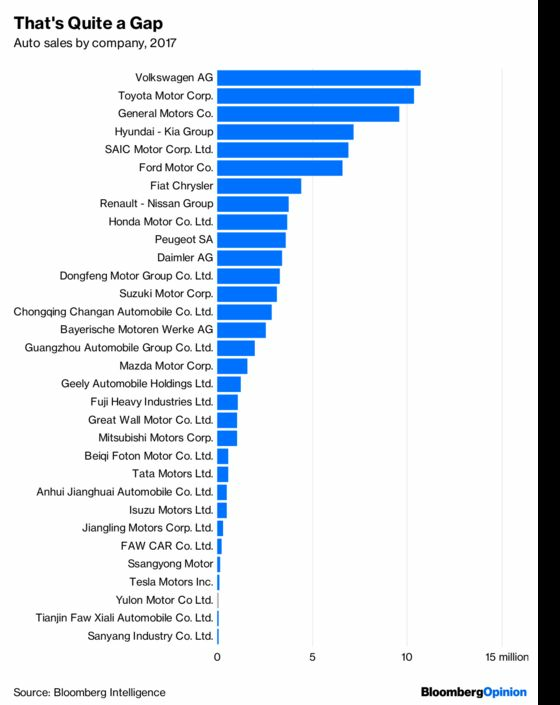 In terms of output and sales, it would be an extremely large privately held automaker: smaller than a major automaker subsidiary and tiny compared to the biggest listed firms, while producing as a whole a mere fraction of certain popular vehicle models alone. I’ll use Tesla’s 2018 projected sales, which Bloomberg Intelligence estimates will reach 261,000 vehicles, to compare it to big automakers that have a high degree of specialization. Those 261,000 vehicles equal 51 times the output of Ferrari NV’s privately held supercar peer manufacturer Aston Martin and 78 times the output of also-private McLaren Automotive Ltd. A private Tesla would be a very big private automaker indeed. Tesla’s forecasted vehicle sales are more akin to a subsidiary than to a standalone major carmaker. It’s about the same size as Porsche, a subsidiary of Volkswagen AG. It’s half the size of Volvo AB (owned by Geely Holding Group) and about two-fifths the size of Jaguar Land Rover Automotive Plc (owned by Tata Motors Ltd.). At that production level, it’s not even a big model: Tesla’s total sales would be less than BMW’s sales of just its 5 Series model (292,000), and a minor fraction of the sales of the Toyota Corolla (1.16 million) or the Ford F-series pickup (897,000). Toyota Motor Corp. and Volkswagen AG each sold more than 10 million cars last year. The auto market really doesn’t have anything else like Tesla, even though the company plans to reach half a million in sales within a few years. Perhaps going private would allow the company to pursue a strategy of relentless integration without analyst and investor scrutiny. In a tweet thread the day before Musk announced his plan, Andreessen Horowitz partner Steven Sinofsky made the case that Tesla’s “more purpose built engineering” will benefit mass market cars — though it’s unclear if doing so would result in more market share or higher profits. A privately held Tesla would indeed be an unusual creature in an industry that sells 93 million vehicles a year and books $2.5 trillion in revenue.